GUANGDONG, South China — As soon as the sky clears one rainy summer day in Guangzhou, plus-size modeling hopeful Wang Jialin hurries out for a test photo shoot. Passersby stare as she poses on the busy street. “I’m used to it,” the 20-year-old mumbles. At 165 centimeters tall and weighing 94 kilograms, she stands out in Chinese crowds. The long black floral dress she wears is size 5XL, while most stores only carry small, medium, and large. Wang had never considered becoming a model until her mother, who works in the clothing export industry, came across a plus-size modeling agent and suggested that her daughter give it a try. “Chinese people think of beauty as slenderness,” Wang tells Sixth Tone. At school, she was bullied for her size. She doesn’t remember anyone ever telling her she was pretty until she met modeling agent Huang Fei. Fat-shaming is rife in China, whether in everyday interactions or popular media. While many countries have beauty standards that favor the slim, the pressure to be thin is particularly intense in China, where it is common for family members, acquaintances, and even strangers to comment on one’s weight. Chinese people think of beauty as slenderness. Last year, the viral “A4 waist” challenge saw swarms of Chinese girls post photos on microblog platform Weibo to prove that their waistlines were narrower than a vertical sheet of A4 paper. Shortly after, another Weibo beauty challenge launched in which female users posted photos showing off legs skinny enough to be covered by their smartphones. Yet the nation is gaining weight as nutrition and living standards improve and lifestyles change. In a 2015 report, China’s National Health and Family Planning Commission stated that more than 30 percent of the adult population is overweight — defined as having a body mass index of 24 to 27.9 — up from 22.8 percent in 2002. Clothing sizes in China are not standardized across the fashion industry, but “plus size” typically begins at the equivalent of a U.S. size 10 or U.K. size 14. “It used to be that the middle-aged were the main customers for plus-size clothes, but now they have been replaced by young women who can afford trendy clothing and love dressing up,” Huang tells Sixth Tone. In China, plus-size modeling is a relatively new business that only surfaced around 2010. Now, the city of Guangzhou has become the center of the plus-size modeling industry due to the southern coastal region’s flourishing garment export sector and its status as a hub for online women’s fashion retailers. Plus-size models can make over 10,000 yuan ($1,470) per month, twice the average monthly salary in the city, according to state news agency Xinhua. Huang is one of the plus-size modeling industry’s pioneering agents. She sees plus-size modeling not only as a business opportunity with real growth potential, but also as a way to change popular perceptions around fatness, beauty, and health. Since she started her agency in 2012, she has signed more than 20 female Chinese plus-size models, all weighing between 70 and 100 kilograms, but she says she sees demand for many more. Her clients are primarily retailers on Taobao, China’s biggest e-commerce website, who want to showcase their fashion on a range of body types. “We have a great shortage of models, but it’s so hard to find qualified ones,” Huang says. Every day, she receives photos from more than 100 eager young girls with dreams of glamour and stardom, but few make the cut. “I can select maybe one good candidate every couple of days,” she says. Strict beauty standards apply, even in the plus-size modeling world. Huang looks for pretty girls who are at least 1.65 meters tall; are under 25 years old; and have a relatively slender waist, a long neck, and — most importantly — a small, photogenic face. “These requirements rule out most big girls who want to be models,” she says. Huang herself is plus size, weighing 80 kilograms. The 34-year-old Guangzhou native studied sculpture at university, which she says gave her confidence in her aesthetic judgment. “I can tell immediately that you’ll be a popular model,” she tells Wang. But though she encourages Wang to take pride in her appearance, she also asks Wang to lose 15 kilograms in two months so she will have a more defined hourglass figure. Huang used to model herself, in addition to running her own clothing shops and restaurants. She got her start in 2010 when a friend asked her to pose for his plus-size online boutique. Back then, she says, the nascent industry was so desperate that she was chosen despite her height. She quickly saw an opportunity to build a business by recruiting girls who were taller, prettier, and younger than herself. I have this sense of crisis; I feel like I need to constantly improve so I’m not eliminated by this industry. As Cai grew older and the industry matured, she decided to step aside and become an agent. 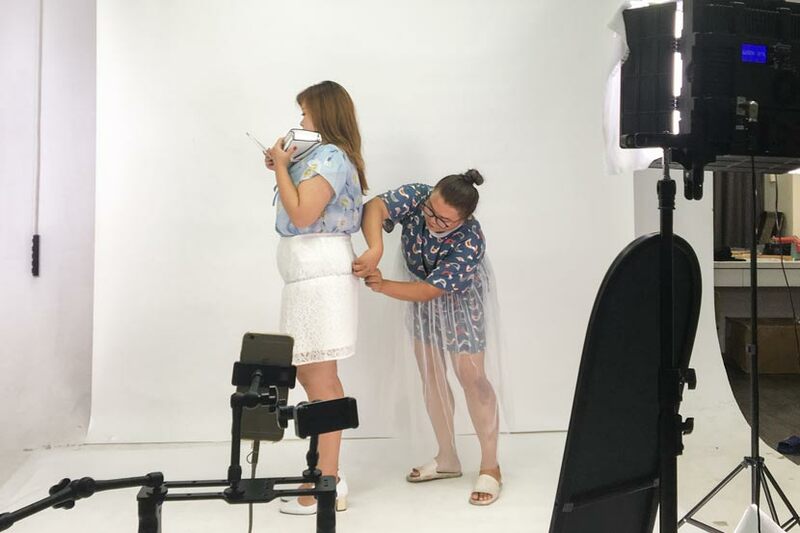 She’s also in charge of a live-streaming channel for a plus-size Taobao shop. “Customers trust us if they see girls their size trying on the clothes in front of the camera and answering all kinds of questions live,” Cai says. One store for which she used to model herself boosted its sales from a few pieces a month to several hundred a day after Cai replaced a slimmer model. Wang says that as brick-and-mortar shops don’t carry her size, she relies on Taobao, which boasts hundreds of retailers that sell plus-size clothes. But she only buys from those that use plus-size models, which she says make up a small minority. Every week, Wang Lanxi presents a two-hour live stream for a Taobao store with another model, He Jiahui, also 22. The duo try out a dozen new items in front of some 10,000 viewers, explaining which styles pair best. Before this week’s broadcast, He spent nearly eight hours at a lingerie shoot for her own Taobao shop that hasn’t officially opened yet. After failing to find any decent plus-size lingerie in Chinese stores, she decided to order 122 sets from a manufacturer in eastern China and start her own shop. She plans to launch by Qixi Festival — known as Chinese Valentine’s Day — which falls at the end of August this year.